About twenty years after the tragedy of 1994, about 1,500 elderly genocide survivors from around the country are still either homeless or living in poor, unsatisfactory conditions. The government, through the Genocide survivors fund (FARG), says it is ready to build houses for the homeless and to rehabilitate those which are in critical conditions. The program groups elders together, in order to facilitate their supervision regarding their living conditions, their health, and their assistance in general for a better, less lonely living style. In order to make this feasible, Theophile Ruberangeyo, the executive secretary of FARG, says they are thinking of constructing and rehabilitating shared, group. “These elders suffer from loneliness and lack of care, but if they are somehow together, they will interact each other and it is very easy to be aware of their neighbors’ problems”, he said. Apart from being old aged, some of these widows have other health problems like disabilities, and these should also get special care. Local leaders, through a video-conference last week, expressed worries that the given budget is not enough to make sure that the houses are sustainable. For instance, 944 houses slated for rehabilitation were allocated Frw 300 million, a small amount for so many houses. However, Ruberangeyo assured that there is a plan to have the budget increased in the upcoming budget revision. Some districts, like Gisagara, have already adopted the plan. Leandre Karekezi, the mayor of Gisagara district, says that once the elders were living close to one another, it was easy to protect and care for them. “There even some activities that they can do if they are together. They feel somehow not alone as they could feel if everyone is in his or her own house”, he said. Inkeragutabara will build the houses, and most of districts have already signed contracts with them. Districts that have not yet signed contracts are requested to do it as soon as possible in order to have all activities starting in all districts. James Musoni, the Minister of Local Government, appreciated the initiative, arguing that it will help in making sure that these elders are well assisted. He suggested that there be a social worker hired to supervise these elders, providing services like counseling, among others. According to suggestions from local leaders, each house will accommodate four or five widows. The Minister requested that the FARG establish an overall design of these houses in order to start the construction. The United States has praised the government of Rwanda for its tremendous strides in improving the lives of Rwandans by increasing the rate of life expectancy for its citizens and reducing the maternal mortality. Speaking at the Africa Health Forum in Washington DC on Friday, the US Deputy Secretary of State William J. Burns said that the country is on track to meet many of the Millenium Development goals despite challenges the country faced after the 1994 Genocide against Tutsi. The US diplomat went on to thank the current African leadership for the dramatic transformation of the continent. “We gather here today amidst a dramatic transformation of the African continent from a region once defined largely by its problems, to a region defined increasingly by its possibilities… from a region afflicted by conflict, crisis, and impoverishment to a region known more and more for its economic growth, expanding democratic governance, and enhanced health and human development,” said William J. Burns. He emphasized that as the continent evolves, and as governments take on greater leadership and responsibility for their own future, the nature of assistance and cooperation from the international community should evolve as well – from a donor-recipient relationship to more of a partnership. “This partnership – based on principles of country ownership, shared responsibility, and mutual respect – allows donors and partner countries to better meet the needs of the country’s population. Where transparency, good governance, and accountability are enshrined in law and in practice – our joint investments will yield more effective, more efficient, and ultimately more sustainable outcomes. The US Deputy secretary of State told delegates that United States commitment to global health is strong, citing President Obama’s budget request for a $1.65 billion contribution to the Global Fund in fiscal year 2014 as US’s historically high level of support. The Forum was attended by Ministers and representatives of Ministries of Finance and Health over two dozen African countries. Rwanda is globally hailed for presenting a unique case in development and in the progress towards attaining the MDGs. President Paul Kagame has described Aloisea Inyumba, the late Minister of Gender and Family Promotion, as a selfless leader, who was ideologically clear. “She was a very good cadre and ideologically clear, she was more than just a minister, governor, senator…those are positions that come and go; Inyumba was not just another leader, that’s the difference,” the President told mourners at the Parliamentary Building where the late minister’s body lay in state. Kagame praised the deceased for her dedicated service during and after the liberation struggle, describing her as a “fearless cadre” of the Rwanda Patriotic Front (RPF), who put her life on the line for the good of the liberation movement and country. The President, who said he first met Inyumba around 1985, eulogized the late minister as a trusted and patriotic cadre who had the ability to cultivate a good working relationship with anyone and bring rivals on the same table. He said Inyumba’s character symbolized Rwanda’s own experience of perseverance and triumph, and urged the nation to uphold her legacy. 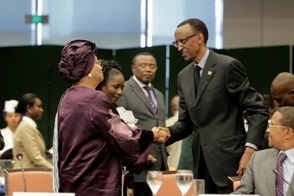 “Today we bid farewell to her body, but her values live on,” Kagame said. Inyumba succumbed to cancer from her home in Kigali, last Thursday, two weeks after returning from a hospital in Germany. After her first stint in Cabinet, Inyumba went on to serve as the Executive Secretary for the National Unity and Reconciliation Commission (1999-2001), during which time the country was going through a critical phase of truth-telling, reconciliation and healing – from the Genocide and its after-effects. During that period, she actively spearheaded a national adoption campaign to place Genocide orphans in homes. Later, she was appointed the governor of the Kigali Ngali province before joining the country’s inaugural Senate in 2004, and in May 2011 reappointed to Cabinet. She spent her last days urging the public to adopt children from orphanages and to raise them as their own, with the view of phasing out orphanages. The President talked of how he practically forced Inyumba to take medical leave after she had insisted on accomplishing certain official responsibilities. Mourners formed a long line to view the body of the late minister in a casket draped in national colours, before they headed to Christian Life Assembly (CLA) church for funeral service ahead of burial at Rusororo cemetery in Gasabo District. Earlier, Cabinet Affairs minister Protais Musoni eulogized Inyumba on behalf of those who had worked with the fallen minister over the years, as did the central bank vice governor and chairperson of Unity Club (association of current and former senior leaders and their spouses), Monique Nsanzabaganwa. They both described her as a heroine, and exceptional and charismatic leader, who will be dearly missed. Inyumba is survived by a husband (Richard Masozera, the head of the Civil Aviation Authority) and two children, aged 15 (girl) and 10 (boy). With only Rwf 3500, four old chairs and two tables previously solicited from family and friends, in a small garage in Gikondo, Zulfat Mukarubega started a restaurant. The year was 1979. Last year, over 30 years later Zulfat’s business entity, the Rwanda Tourism University College (RTUC) was listed the seventh biggest local investment registered. According to RDB with about $15.7 million (Rwf9.4 billion), she is now intending to expand her interest in real estate and construction activities. With this investment, she is probably Rwanda’s richest female entrepreneur. In an interview with The Chronicles’ Matthew Rwahigi she talks about her journey through the business world and the muddy waters she swam to success. Below are the excerpts. When I started it wasn’t common for a woman to do business. I had saved Rwf5,000 from my previous employment where I worked as a secretary in Gikondo. In this place there were a number of warehouses and those who manned them didn’t have a lot of choices for meals. With my savings, utensils from my home and furniture from friends and family I started off a business with only Rwf3, 500 as operational capital. I bought the essentials and started to serve breakfast. The profits went on to cater for lunch requirements. After a year, I went into merchandising. I developed ‘hunger’ for changing the impression about customer care in restaurants and hotels. The idea of RTUC (Rwanda Tourism University College) was born and it was and still the first of its kind. RTUC now offers technical, theoretical and practice knowledge to those involved in service delivery which involves short courses and degrees for hoteliers plus a degree in Business Information Technology. We now have more than 2500 students. How much is your business worth at present? In the previous year of 2011, my business was worth Rwf2.2 billion but I expect that the value has gone up. That’s a lot. Where do you get the money to run this business? Money is never a problem in running a business; all that matters is planning. Personally I focus on using the little money I have and let the support come in later from banks and elsewhere. I have also had support from government which sponsors some of the students at the university. Our work force is now composed of 124 employees working in both the Kigali and Gisenyi campuses. When did you get your first one million Francs? Because of the strategies I was using and the efforts I invested in minimising my expenses in business, I hit the one million mark a little sooner. Like for the whole first year in business, I used to walk about twelve kilometres to and from my home in Nyamirambo. My work place was in Gikondo. This was because I needed to save. What did you use it with? Of course I did not try to improve my family’s living standards in haste. Instead, I saw another opportunity in merchandising. You were registered as one of the biggest investors in 2011, how big is the investment? The money I injected in business in 2011 was around Rwf500 million. The secret is categorised in two. First … identifying one’s potential and the field in which they can best exploit that potential. The other was starting a business in the best interests of solving certain problems that existed in our society. This is different from starting a business because you want to make money. Are there problems you have encountered in your business life that you think were as a result of being a woman? I would tell people about this project and rather than professionally criticise it, they would tell me that “uwo numurengwe wabagore bafashe kugafaranga” (my idea is day dreaming. It’s being ambitious because you have gotten some little money). This could at times discourage me but later I could rise and pursue my dreams. How do you manage family and work? First of all, I am a divorced woman. I have been divorced since 2000. Sometimes you know certain ambitions can cost you in one way or another. My children are grown up, the youngest is sixteen years old. We do everything together, so there is no problem in handling both family and work. It is important that women understand that equality does not mean ceasing to respect their husbands but it is a way of helping them to build a better home . Some men end up thinking that a rich woman is a threat rather than an opportunity to their families. Why aren’t there many Rwandan women in business? There are very few entrepreneurs in general. But for women, many of them fail to create new ideas mainly because they want to have things the easy way. They do what others have done thinking that these things will give them similar results. On the contrary, practice has revealed that women can actually do much more than ever was expected. Where do you see the Rwandan businesswoman in the next five years? I can best speculate by looking at what Rwandan businesswomen have achieved in the past five years. When I had just started the RTUC project in 2006, bankers told me, “this is a man’s project and so we cannot finance a woman to do it because we are not sure she can succeed at it”. But even under such conditions, women have fully been productive in business to the extent that a woman receives credit for a big investment, beating men to it. This means that in Rwanda today, with a President who has fully supported women’s participation in all sectors; in five years to come enterprises run by women might be the majority. When more than half of the world’s population wakes up on Thursday – the 101st International Women’s Day – it will be hard to know whether to celebrate or give in to despair. A British woman will face the prospect of at least 14 more general elections before women equal men in the Commons. But a woman in Qatar will be six times more likely to go to university than the man next door. The global gender gap defies simple solutions. Eighty-five per cent of countries have improved conditions for women over the past six years, according to the World Economic Forum, but in economic and political terms there is still a long way to go. “From London to Lahore,” says Oxfam, “inequality between men and women persists.” Here The Independent on Sunday explores the best places to be a woman today. Iceland has the greatest equality between men and women, taking into account politics, education, employment and health indicators. The UK comes in at 16th place, down one since 2010. The worst is Yemen, and the most dangerous is Afghanistan. Rwanda is the only nation in which females make up the majority of parliamentarians. Women hold 45 out of 80 seats. The UK comes in at 45th place, behind Pakistan and United Arab Emirates. The worst countries, such as Saudi Arabia, Yemen, Qatar, Oman and Belize, have no women in parliament. Norway is the world’s best place to be a mother, with low risks of maternal mortality – one in 7,600 – and skilled help at nearly all births. The UK is ranked 13th. The worst is Afghanistan, where a woman is at least 200 times more likely to die during childbirth than from bombs or bullets. Literacy rates among women in Lesotho exceed those of men, with 95 per cent of women able to read and write, compared with 83 per cent of men. The UK is ranked 21st. The worst country is Ethiopia, where only 18 per cent of women can read and write, compared with 42 per cent of men. Women have run Sri Lanka for 23 years. The UK comes in at seventh place, while dozens of countries, including Spain and Sweden, have never had a female head of government. The Swedish Arts Council has launched initiatives to improve gender equality in the arts. The Swedish Film Institute mandates that film grants be distributed evenly between men and women and there are quotas for women in film production. In the UK, only 6 per cent of film directors and 12 per cent of screenwriters are women. Thailand has the greatest percentage of women in senior management (45 per cent). The UK did not rank in the top 20 countries, with 23 per cent of senior management made up of women. The lowest is Japan, where 8 per cent of senior management positions are held by women. Greece is the world’s safest place to give birth, with a one in 31,800 risk of dying in childbirth. The UK is in 13th position, but the worst place to have a baby is thought to be the world’s newest country, South Sudan. There are fewer than 20 midwives in the whole country. The Bahamas holds the top spot globally for economic participation and opportunity for women. The UK ranks 33rd. The Bahamas has closed its gender gap by 91 per cent in the past six years, while the lowest-ranking country, Yemen, has closed only 32 per cent of its economic gender gap in the same period. The Caribbean is the region with the highest proportion of TV, print and radio news stories reported by women (45 per cent). The worst region is Africa, with 30 per cent of stories reported by women. Europe comes in at 35 per cent. In the UK, about 9 per cent of national newspaper editors are women. Sweden permits women to have abortions without restrictions for the first 18 weeks of pregnancy and there are no mandatory consent requirements. El Salvador, the Philippines and Nicaragua are among the worst because of a ban on all abortions. British women can have an abortion up to 24 weeks; two doctors have to give consent. Burundi in sub-Saharan Africa ranks first for labour force participation and is the only country where the female labour force participation rate (92 per cent) is higher than that of men (88 per cent). The UK is ranked 47th. The worst country is Pakistan, where the labour force is made up of four times as many men as women. Luxembourg shares the top spot (with Norway) for estimated earned income. When income is capped at $40,000, women and men are as likely to earn the same amount. The UK is ranked 23rd, while the lowest female earners are in Saudi Arabia, where women earn $7,157 to men’s $36,727. In Qatar six women are enrolled in tertiary education for every man. Questions remain as to whether their investment in education has led to the integration of women into the economy. The UK is ranked 38th. The worst country is Chad, where three times as many men are enrolled as women. Women in Japan can expect to live longest (87), beating men by seven years. Female life expectancy is shortest in Lesotho (48), but only two years less than men. Life expectancy in the UK has reached its highest recorded level for men (78) and women (82). It has the smallest gender gap, four years, of any country in the EU. Women in Denmark have more time for leisure, spending only 57 more minutes each day on unpaid work than men, the lowest in the OECD. British women spend two hours more per day doing unpaid work than men. Mexican women have it hardest, spending four hours 21 minutes more on unpaid work than men. Five of the top 10 highest-paid female sporting athletes in 2011 were from the US. The worst country, Saudi Arabia, has never sent a female athlete to the Olympics and bans girls from sports in state schools. Sponsorship of British women’s sport came to 0.5 per cent of the market between January 2010 and August 2011. The Micronesian island of Guam has the highest divorce rate in the world, and Guatemala has the lowest. The number of divorces in England and Wales in 2010 increased by 4.9 per cent since 2009. New Delhi is the best place for women wanting to break into the male-dominated world of taxi drivers. An NGO in the country’s capital launched an initiative to train women in the first radio-taxi service run only by women. The worst country is Saudi Arabia, the only country in the world to ban women from driving. Jamaica has the highest ratio of women in high-skilled jobs, such as legislators, senior officials and managers. Almost 60 per cent of these roles are filled by women. The UK is ranked 35th in the global survey, with Yemen coming last. Women there take up only 2 per cent of high-skilled jobs. Equals is a partnership of more than 30 charities and arts organisations, bought together by Annie Lennox to celebrate International Women’s Day. President Kagame receives Charlie Denson, President, Nike Brand Inc.
President Kagame today received in his office Charlie Denson, President of Nike Brand Inc. and his delegation. Good evening, everyone. Thank you very much for coming out and thank you for welcoming me to the Kigali Institute of Science and Technology. I want to thank very much and warmly from the bottom of my heart the Foreign Minister for her very kind introduction. Honorable ministers, thank you also for being here. I’d like to thank the Rector of the Kigali Institute for hosting me today and for all the great work that went into pulling this event together. And I’d also like to thank my colleague, Ambassador Don Koran, the American ambassador to Rwanda and his entire team at the U.S. Embassy for their assistance as well. I have come to Rwanda to bear witness to the remarkable progress you have made against all odds. Rwanda holds its own tragic place in the 20th century’s grim litany of mass violence. As you know so well, the evil of genocide came swiftly, home by home, in the form of men with machetes, calls to murder hissed out over transistor radios, lists of innocents for slaughter. Deliberate, direct cruelties that still leave us shocked and shaken. Rwanda did not suffer from so-called “ancient hatreds.” It suffered from modern demagogues: from the ex-FAR, the Interahamwe, Radio Mille Collines. It suffered from those who were willing to kill in the name of difference, from those who saw division and death as the path to power. And it suffered from the indifference of neighbors, international institutions, and individual governments – including my own – that failed to act in the face of a vast, unfolding evil. Tomorrow, I will take my husband and two children to the genocide memorial here in Kigali, so they can experience what I have learned in my prior visits. We will pay our respects both to those forever lost and to the brave survivors, who challenge us all even to comprehend their enduring sacrifices and extraordinary strength. Today, I am here as an American ambassador. But I also will speak for myself, from my heart. I visited Rwanda for the very first time in December 1994, six months after the genocide ended. I was a young Director on the National Security Council staff at the White House, accompanying the then-National Security Advisor, Anthony Lake. I was responsible then for issues relating to the United Nations and peacekeeping. And needless to say, we saw first-hand the spectacular consequences of the poor decisions taken by those countries, including my own and yours, that were then serving on the United Nations Security Council. I will never forget the horror of walking through a church and an adjacent schoolyard where one of the massacres had occurred. Six months later, the decomposing bodies of those who had been so cruelly murdered still lay strewn around what should have been a place of peace. For me, the memory of stepping around and over those corpses will remain the most searing reminder imaginable of what humans can do to one another. Those images stay with me in the work I do today, ensuring that I can never forget how important it is for all of us to prevent genocide from recurring. Here, after three long months, the genocide finally ended. But the destruction was hardly over. Up to a million dead. Another million refugees scattered across borders, including thousands of genocidaire eager to resume battle. Zaire was their rear base, and the refugees in UN-supported camps were their hostages. Rwanda, according to the World Bank, in just a few months had become the poorest country on earth. And within a few short years, it sent forces into neighboring Congo. “Africa’s first world war,” as it was called, claimed millions more lives from battle and disease. Yet, even as war still raged, another story was beginning to play itself out. The people and the new government envisioned a different Rwanda, one where reconciliation replaced division, where healing helped salve deep wounds, where self-sufficiency could eventually defeat despair. Having endured the worst, you nonetheless aspired for the best. First, you worked to address the past, so your future could come sooner. The International Criminal Tribunal for Rwanda is finally winding down. Gacaca courts, adapting traditional justice practices to the overwhelming task of separating the innocent from the small fish, and the small fish from the most guilty planners and perpetrators, brought a measure of justice and reconciliation. Many former ex-FAR-Interahamwe militants have been reintegrated into society. Though much more remains to be done, the processing of cases, the commuting of sentences to community service, and the building of new jails have combined to reduce the number of prisoners by half over the past decade. Gradually, deliberately, Rwanda has been trying to make itself whole. Over time, you have implemented enlightened gender policies, advanced new development models, insisted on clean government, and made forward-looking investments. You are living in the midst of astonishing change. I know that perhaps in the stress of daily life, it might not seem like much. Undoubtedly, you want more and faster change – more development, more opportunity, more freedom. And you deserve it. Your progress, of course, has been uneven, with economic development far outpacing political development. But, as you naturally strive for a brighter future, don’t lose sight of how far you have come. To many Americans and other foreigners, what you have achieved in seventeen short years is truly impressive. It gives us hope and new models. It shows other developing countries emerging from conflict what can be accomplished with effective policies and committed citizens. South Sudan, Liberia, the Central African Republic, Haiti, Guinea, Nepal and many others would do well to take a couple pages from the book you have begun to write for Rwanda. Rwanda is just such a partner. Starting with women. The genocide and war reduced the male population disproportionately, leaving a leadership vacuum. The government and international donors – notably the United Nations Development Program and the Inter-Parliamentary Union – turned this into an opportunity. Women were trained in parliamentary leadership, and 30 percent of parliamentary seats were reserved for women. Yet by 2003, women had won 48 percent of the seats in the lower house, more than a third of which were unreserved seats. In 2008, women as you know took an even greater share: 45 out of 80 seats, making Rwanda the only country in the world to this day with a female parliamentary majority. This puts the rest of us to shame. Economically, you’ve made an astonishing recovery: per capita gross domestic product has tripled since 1994. The foundation for this growth of course has been agriculture. The government, with external support, has reduced soil erosion through terracing and tree planting. It’s promoted effective use of fertilizers and pesticides, which has increased production. Consolidation of landholdings is slowly transforming farm production from subsistence to industrial levels, despite its complexities. Over the last decade, agriculture has grown at 5 percent or more per year. The United States is proud to play a small part in that growth through President Obama’s Feed the Future initiative. At the same time, you have seen your economy diversify. Eco-tourism is becoming a major success. The services sector is now the largest in the economy, growing at about 10 percent a year. The driver of Rwanda’s development is, first and foremost, the commitment of its people as well as the government to make development a priority. Combined with determined and able governance, a firm belief in innovation and entrepreneurship, and high-quality foreign aid that comes from meaningful and genuine partnerships; and a deliberate strategy for engaging the free market, this commitment is translating into tangible results. Balancing all these factors is never easy. And let’s be honest, no government today can claim to be getting it exactly right when it comes to economic governance and performance. Still, Rwanda is making striking progress. The World Bank’s “Doing Business in 2012” analysis once again raised Rwanda’s ranking: it is now 45 out of 183 countries. Not so long ago, Rwanda was ranked 141. That is a massive leap. The World Economic Forum’s Global Competitiveness Report now ranks Rwanda the 70th most competitive economy in the world; just two years ago, it was the 80th. The World Economic Forum gave extremely high ratings to Rwanda in three areas: participation of women in the labor force, the ease of starting a business, and the cleanliness of government. Today, I had the opportunity to visit Kigali’s One-Stop Shop, One-Stop Center, the Rwanda Development Board, and saw firsthand that it is easy to start a business here in Rwanda. And Rwanda’s policies aimed at rooting out corruption only make it easier. In its most recent global-corruption report, Transparency International rated Rwanda the least corrupt country in East Africa. Yet, perhaps the greatest challenge of all, the one that takes generations to accomplish, is building human capital — raising up the health, education, and skills of a nation. Rwanda has focused on primary education; thus, you are investing in the future. Roughly 43 percent as you know of your population is under the age of 15. Education spending has risen steadily as a share of Gross Domestic Product and now accounts for about a fifth of your national budget. The bulk of this goes to basic education, through the 9th grade. Literacy rates have risen already from 58 percent in 1999 to 71 percent in 2009. This year, the government proposed increasing free universal education from nine years to twelve and continues to invest heavily in teacher training to raise the quality of instruction. Healthier children of course make better students, and my country has devoted much of our assistance to improving health care here. Whether you are measuring immunization rates or the use of insecticide-treated bed nets, healthcare practices here are improving. Basic health insurance is accessible to almost all Rwandans, which is more than I can say for the United States. The share of government expenditure devoted to healthcare has more than tripled since 1996. The mortality rate for children under five has, in just five years, been reduced by more than half. Yes. And thanks to agricultural policies, protein and calorie production have reached international standards. Rwandans are swiftly becoming better educated, better fed, and better cared for. As a small, densely populated, landlocked and mountainous country, Rwanda has few natural assets that can facilitate economies or fuel trade. So the government is looking to digital technology to build virtual ports and shrink the distance between Rwanda and the global economy. Information and communications technologies are critical to developing both the productive capacity and the human capital that together form the foundation for lasting economic growth. The number of internet users in Rwanda more than doubled in the last few years. It is certain to increase much more as the country’s fiber-optic network – completed just last year — gets fully up to speed. Cellular and wireless access will help transform Rwandan society. Advanced technology though does more than just ease communication. Most developing countries have sought to get their energy the cheapest way they can, which is usually the dirtiest: by chopping and burning trees, burning diesel fuel, or burning coal. Rwanda is taking advantage of technology and its own natural gift of water to build a hydro-power industry, which already accounts for half of the country’s electricity generation. You also have projects underway to transform dangerous methane gas into a clean source of electricity. As a member of the East Africa Community, Rwanda is helping build a larger market that will foster intra-regional trade, spur investment in infrastructure, agriculture and energy, and strengthen all of the Community’s members by harmonizing policies and practices. Similarly, the U.S.-Rwanda Bilateral Investment Treaty, which was just ratified by our Senate in September, will solidify business ties between our two countries. Rwanda’s economic and social progress has also been accompanied by a parallel rise in its international stature – from a collapsed and divided state, to a respected partner in security and development. Relations with your neighbors have improved markedly. Even more, you’ve taken the terrible materials of the past and transformed them into a mission to bring peace. Rwanda’s peacekeeping contributions began in 2004 with the deployment of less than a couple hundred military personnel to Darfur as part of the African Union mission. Now, there are 3,500 Rwandans involved in UN missions around the world. While most of Rwanda’s peacekeepers serve in Sudan, they have also proved valuable in Liberia, Cote d’Ivoire, Haiti, the Central African Republic, and Chad. Rwanda has paid the ultimate price on these missions, losing its sons. And I want to send, extend my personal sympathies and those of my government to the families of Sergeant John Twahirwa and Private Samuel Ntakirutimana, who gave their lives in Darfur just a few weeks ago. For Rwanda, peacekeeping is practiced not in isolation, but also within the context of development. In Sudan, Rwandan soldiers have spread the Umuganda work tradition. They’ve manufactured bricks to build schools, and introduced rondereza – energy-efficient stoves – so women will not run such a risk of attack while searching for firewood. This doctrine requires that the international community protect civilians even at the expense of a national government’s sovereignty, if and when that government fails to protect its own citizens – or, worse still — is attacking them itself. This is a concept with special significance for Rwanda. And as you would expect, Rwanda is known globally as a strong and principled proponent of the responsibility to protect. Every situation is different, and of course each situation calls for a different policy response. Yet many of us heard strong echoes of 1994 when Muammar Qaddafi promised he would root out the people of Benghazi and go house to house killing innocents like “rats” as he called them. Just yesterday, as the Foreign Minister said, I was in Libya. And there, I visited a detention facility that Qaddafi’s forces had torched before retreating from Tripoli. Over 100 people were killed by bullets and grenades in one small warehouse, and then their remains were lit on fire. I knew from my visit to Rwanda in 1994 that such atrocities were likely in Libya, if Qaddafi went unchecked. I knew we should act, and so did President Obama. Despite the risks and the costs, President Obama was determined not to sit back and watch another predictable horror unfold before his eyes. He knew that doing nothing would not only again stain our national conscience but also deliver a license to dictators to kill the Arab Spring in its very crib. He knew it would also send a terrible message about the international community’s inability to act – even with a call for help from the Libyan people and the Arab League, even with the capability to stop a massacre that would have left tens, if not hundreds, of thousands dead. My President refused to let that happen. Knowing a no-fly zone alone would be too little too late, President Obama ordered me to try to get from the United Nations Security Council a robust mandate to protect civilians, one that allowed the aggressive use of airpower to halt Qaddafi’s advance. This time, the Security Council acted. And acted in time. Having failed in Rwanda, having failed in Darfur, it did not fail again in Libya. Within less than two days, American firepower played a decisive role in stopping Qaddafi’s forces and saving Benghazi, and our coalition continued its efforts to protect the Libyan people. Because we all acted, countless men, women and children were spared. Because we acted, the Libyan people had the time and the space to end the Qaddafi regime and start a new beginning. Because we acted, the international community gave meaning to the promises that have been made by so many so many times here on Rwandan soil – that we will not stand idly by when we have the capability to stop an atrocity. That is also why the United States is sending military advisors to support Central African states as they try to put an end to decades of war crimes committed by the Lord’s Resistance Army. When it came to Libya, many African nations were silent, skeptical or even harshly critical of the decision to intervene to protect innocents. Not Rwanda. Alone among African nations outside the Security Council, Rwanda readily and publicly agreed. “Our responsibility to protect is unquestionable,” President Kagame said. And I further quote: “This is the right thing to do, and this view is backed with the authority of having witnessed and suffered the terrible consequences of international inaction.” So Rwanda has not just moved beyond its own genocide, it has consistently led by example, from Darfur to Libya, in standing up against those who would commit genocide or mass atrocities. I have visited Rwanda now several times, and as always, I come here as a friend. This time, for the first time, I will be joined by my family. I want them to see your beautiful country and to learn what can be accomplished when a proud people unite in common cause. I want them also to witness and take inspiration from your achievements. I believe as well that friends should speak frankly to friends. Rwanda’s economic vitality has moved the country forward. Social progress has been substantial. Yet, the political culture in Rwanda remains comparatively closed. Press restrictions persist. Civil society activists, journalists, and political opponents of the government often fear organizing peacefully and speaking out. Some have been harassed. Some have been intimidated by late-night callers. Some have simply disappeared. Yet, the world is moving rapidly in a different direction. Across the globe, including in societies where the common wisdom was that freedom would never arrive, we’re seeing people demand the right to chart their own future, to organize peaceful demonstrations, and to criticize their own governments. From an angry young fruit seller in Tunisia, the demand to be heard has spread across North Africa and the Middle East. It has been taken up in Egypt. Then Libyans demanded the end to Qaddafi’s 42 years of tyranny. Today, Syrians and Yemenis are being killed by their governments simply for saying what they think about their leaders and their future. But they will keep speaking out, because they have a universal right to do so. And they know it. The deepening and the broadening of democracy can be the next great achievement of this great country and its remarkable people. In Rwanda, economic development and political openness can reinforce each other. This is Rwanda’s next great developmental challenge. And, with all that you have achieved over the past 17 years, I am confident you will pass this milestone as well. Already, you are an example to all nations of what can be accomplished. You are an example to all nations of what can be accomplished after disaster strikes. Nothing can bring back what this nation has sacrificed. Grief wanes, but it never ends. Yet, we also know that the living must do credit to the lost, by building the future they should have been here to help build. A nation, just like a people, can overcome. Rwanda is proof. Nearly half of Rwandans today were born after the genocide ended. The generation that came through the genocide is passing on a country much more rich with possibility, healthier, better educated, and at peace. I am grateful to witness your extraordinary progress. And, I am proud to affirm that the United States will continue to stand with you, in friendship and partnership, as you take Rwanda to the next level of development and democracy. Thank you, very, very much. Rwanda was recently voted 10th Best Country in the Common Wealth for a girl to be born, with the UK coming in at number 8 and Brunei Darrusalam(Common Wealth’s richest country) at no.23! The report explores how well the 54 Common Wealth Countries are doing to promote girls and women as agents of change and uses indicators that reflect various aspects of a girl’s life e.g. fertility rate of girls aged 15-19, access to education and other resources, life expectancy, Commonwealth scholarships and fellowships taken up etc….